My favorite meal to have when dining out is breakfast. 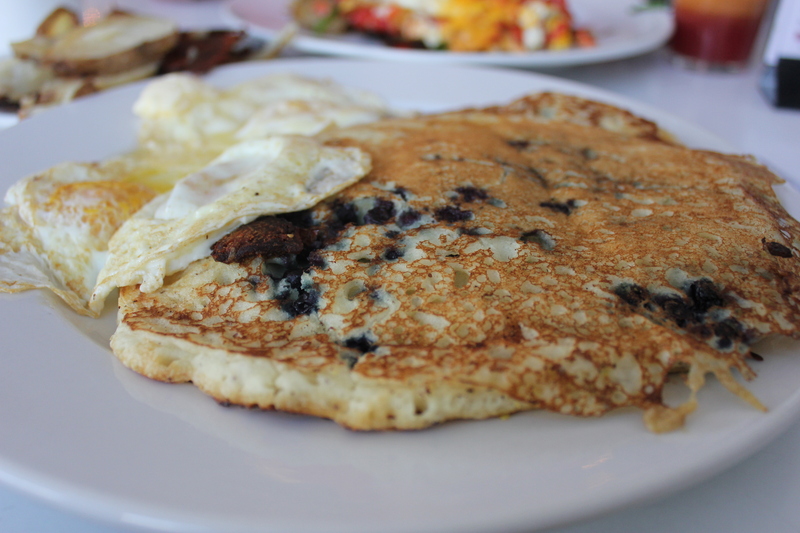 When I find a spot with good gluten-free pancakes, they have a loyal customer in me. Succotash is one such spot! 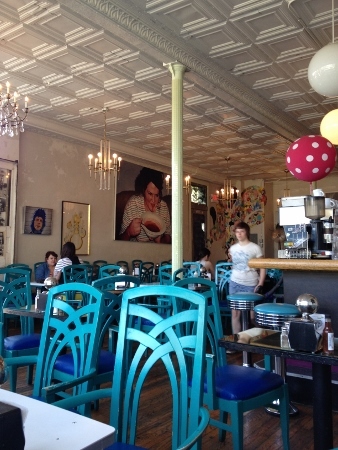 Succotash is an eclectically decorated bruncheonette, serving breakfast and lunch only. I would eat there if they were open for dinner, too, especially if they served pancakes. I thought I’d share a recent breakfast at Succotash with my favorite fella. 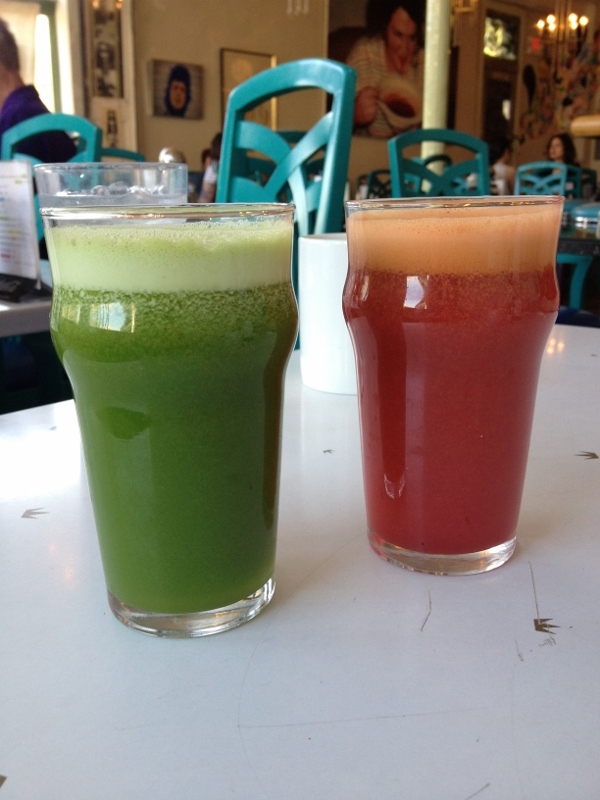 We started with fresh juices, a lawnmower (cucumber, celery, apple, spinach, parsley and lime) for me, a ninja sunrise (carrot, orange, ginger, grapefruit and beets) for the fella. And coffee. You gotta get coffee at Succotash. They brew the good stuff from Oddly Correct. 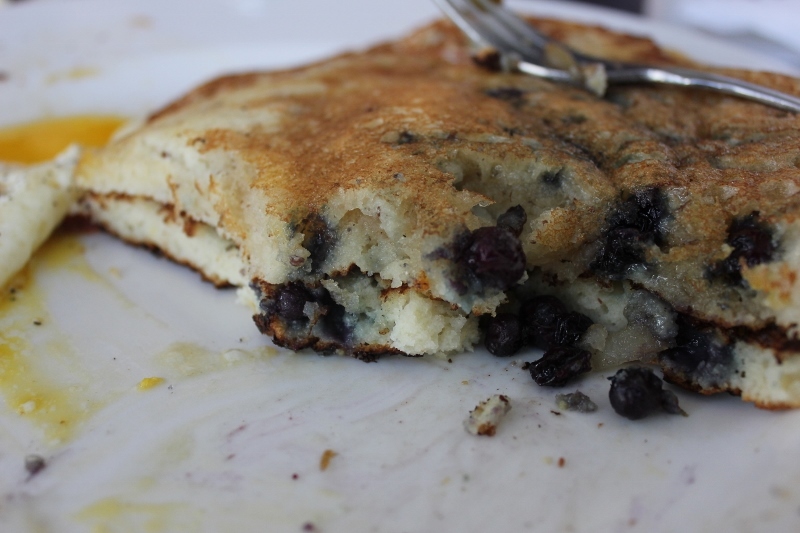 The gluten-free pancakes, which contain dairy, are available plain but I like mine with blueberries. I had two fried eggs with them, eggs from Amish farmers just north of KC. I love that Succotash uses local products where possible! Look at those fluffy pancakes! Soooooo good. I’m not kidding when I say I could eat these every day. I asked the owner Beth about a dairy-free option and she is aware of the demand for items that are gluten- and dairy-free and is working on it. In addition to pancakes, gluten-free desserts are offered and available by special order so they know their stuff. I hope a gluten- and dairy-free pancake is added to their menu soon. I may just move in when that happens. The fella had the Veggie Kitchen Sink. 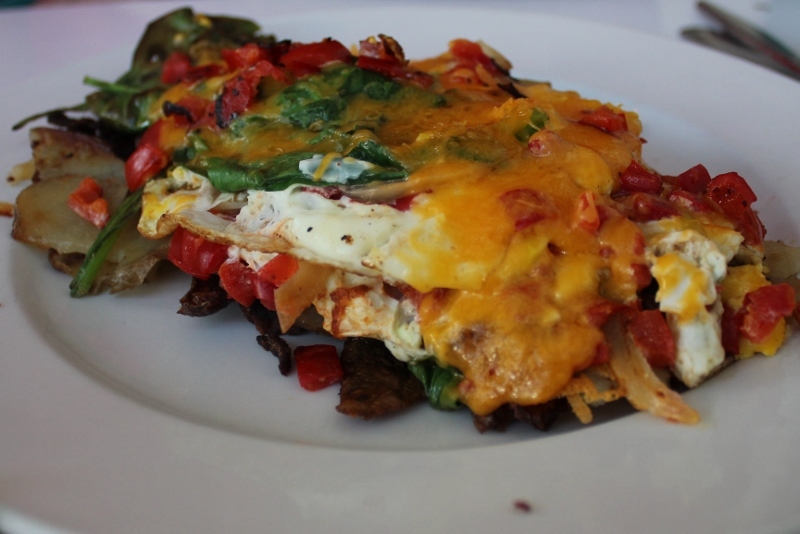 Two eggs with spinach and peppers, topped with cheddar. If you want this to be gluten-free, make sure you ask them to hold the mushroom gravy as it isn’t gluten-free. Speaking of asking them to hold the gravy, just tell the servers here what your dietary restrictions are. They’ve been great to answer my questions and point out items on the menu I might not have noticed that will work well for me, as well as modify items when possible. If you are going here on a weekend, be prepared to wait a bit for a table. It’s worth the wait. Or go on a weekday and have a leisurely meal. Check out all of the artwork, sink into the cushioned booth that fronts the restaurant and watch folks rushing to work while you have a hearty breakfast. And in case I haven’t mentioned it, get the pancakes! 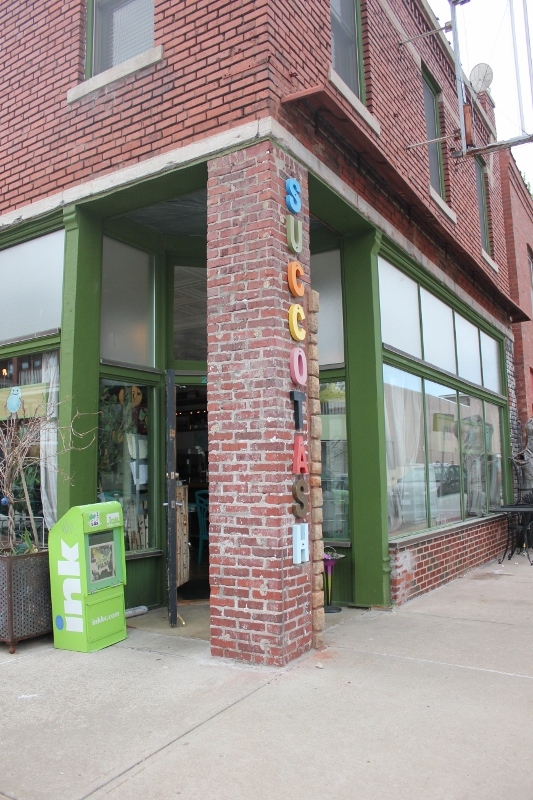 Succotash is located at 2601 Holmes Street in Kansas City, MO. 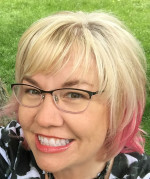 816.421.2807.